The bats have relocated. It’s an unwelcome change for their fans, but it was inevitable. They couldn’t stay in a man-made structure forever. The old warehouse where they resided has been sold and cleaned out, and repairs are in progress. The building was crumbling, and the bats, delicate and magical as they are, made it stink. The man working on the place said the bats were welcome to back if they wanted to for now, but of course they don’t want to. He had the doors wide open and daylight was pouring in. The building is going to be converted into several apartments. As one of my neighbors said, even bats have the sense not to like developers. Years ago, the bats lived in the Methodist church, also known as the pink church. Then, after a fly-out, the church had wire mesh installed over the vents so the bats couldn’t come back in. They moved to the warehouse. Now they’ve moved again. Bat lovers in the T or C hot springs historic district have been watching the sky at sunset. Our little relatives are still around, though in smaller numbers, and we don’t know where they live now. We’ve checked various possible new bat homes. The Baptist Church. No bats. The ice house, an empty building between Rio Bravo Fine Art and the community youth club. No bats. 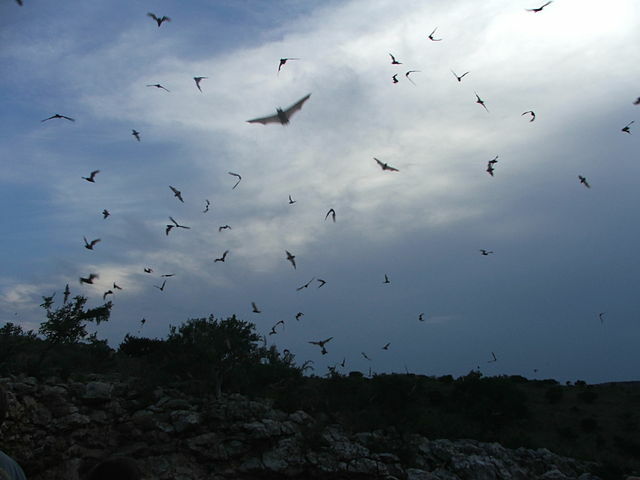 Though I miss the clouds of them in the evening sky, I hope for the bat colony’s sake that they have moved to a nice private cave on protected land where they can stay for generations. Several evenings ago, I took a sunset walk, and a few bats hunted bugs over the streets. I counted seven bats fluttering over the river and the wetlands, but I couldn’t stand by the water and be immersed in them. And gnats are gathering on my ceiling again, though only by the dozens, not swarming the way they do when the bats are entirely out of town. A speckled and striped gecko, no more than an inch long, with a rosy patch on its tiny head, was attempting to sneak into my apartment when I got home from running today. I was tempted to allow it to move in. It was cute and it would eat gnats. But I caught it, admired it, and carried it across the courtyard to a rocky area under a tree. Better for all of us, in the long run. Your threads are always fascinating, Amber; thank you so much for all your lovely insights.